Scenes from the making of "Bonnie and Clyde II"
Of the dozens of films Steven Spielberg has produced without directing over thirty years of filmmaking, never has his stylistic influence been so wholeheartedly appropriated as in Super 8. The latest thriller from director J.J. Abrams (whose Star Trek reboot was also an example of updated homage) is not just a cater-cousin to Spielberg’s iconic canon. It is a nostalgic paean whose fervent devotion is both its forte and, in part, a conspicuous shortcoming. Beyond tiptoeing through the Spielberg’s cinematic tulips, what Super 8 accomplishes best of all is managing to mix and maintain childlike charm amid its chills and thrills. In other words, it’s a resurrection of the spirit of Spielberg’s films pre-The Color Purple, the unofficial start of his unabashed chase for acceptance as an auteur. The technical similarities to Spielberg’s late-1970s/early-1980s work are obvious – indeed, the film is set during 1979 in a small town in Ohio, Spielberg’s home state. From a subfusc palette to distinctive camera pans, zoom into close ups, and lens flares, you feel as through you’re watching a revival of Spielberg’s early thrillers. Moreover, there are the familiar themes of father-son relationships, suburban settings, and adolescent maturation, friendship, and first-love. It’s a story about otherworldly forces discovered by a bunch of kids just trying to make their first homemade movie. Abrams also borrows Spielberg’s ever-keen ability to speak volumes with a single camera frame, starting with the opening shot of a worker changing a steel mill’s “Days Since Last Accident” tally from 784 down to 1. Four months after the untimely death of his mother, Joe (Joel Courtney) remains emotionally adrift and otherwise disconnected from his dad, Jack (Kyle Chandler), a deputy sheriff who still blames his wife’s demise on the town’s drunken miscreant, Louis (Ron Eldard). Joe’s intermittent joy comes from palling around with his schoolmates as they try to make their own low-fi zombie flick, including portly, fast-talking director-in-waiting Charles (Riley Griffiths) and Alice (Elle Fanning), an ingénue who steals all the boys’ hearts with her fetching looks, access to a car, and ability to cry on cue. While filming a nocturnal scene at an abandoned train station, the children witness the calamitous derailment of an Air Force locomotive, deliberately caused by a truck driven by their middle school biology teacher. His dying warning to them, coupled with the train’s mysterious cargo and the sudden arrival of military heavies, send the preteens into a state of panic that morphs into curiosity once something starts scaring away all the local canines, stealing electronic and mechanical devices, and attacking local townsfolk. You can make a game out of ticking off the Spielberg and, yes, Abrams archetypes. There’s a creature whose menace is heightened by the fact that it goes unseen for the opening half film (Jaws along with Abrams’ smoke-monster in Lost and the beast in Cloverfield, which Abrams produced). Like Roy Scheider in Jaws, Jack is a small-town cop forced to confront forces beyond his job description and control – you’ll immediately recognize a scene in which Jack scampers down a city street, navigating menial concerns being lobbed in his direction to while en route to more pressing concerns. And, there’s a science-fiction backdrop that Abrams uses to turn the clock back from Spielberg’s post-9/11 dread (War of the Worlds) to his post-Cold War themes of coexistence and innocence. Specifically, there’s a close encounter with – spoiler alert – an extra-terrestrial whose violent terrorizing turns out to be the consequence of human mistreatment and the being’s innate desire to go home. Indeed, the E.T. homage extends to the kid-centric protagonists – Joe even resembles an Elliott clone. 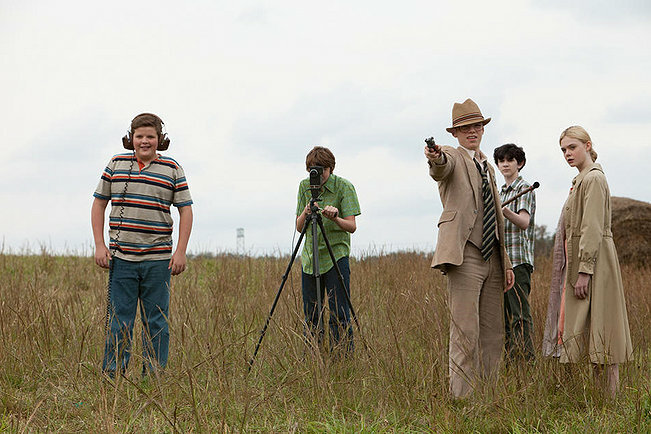 Be warned – Super 8 is not a film for small children, for both its violence (seen and unseen) and salty language. However, the strengths of this Spielberg simulacrum are as basic as the obsolete film technology from which it draws its title. Capable, enthusiastic acting, character development, smart cinematography, and actual storytelling combine for an enthralling, rewarding movie. The audience remains engaged, from the bone-rattling train wreck and the ferocious razzing of a gas station, to quiet, introspective moments, like Joe delicately applying zombie makeup to Alice or the two kids watching home movies of Joe and his mom. The regrettable byproduct of this myth-raking is that Super 8 ends up feeling less a sturdy standalone than merely evocative of the films it photocopies. It’s also a predictable demerit that the climax is both derivative and incapable of living up to its buildup. Regardless, it is the best big-budget movie thus far this season, conjuring not just the spirit of summertime youth but also summertime cinema. Indeed, it says something about the state of movies that the completed amateur film submission that’s finally played over the closing credits is easily more entertaining than most fallow superhero-of-the-week rubbish. I was really disappoint¬ed in this film. I'm withholdin¬g further comments until others see it.